In 2006, the Register of Artists’ Models (RAM) was asked to provide a model for a Life Drawing Hen Party - a novel idea at the time! 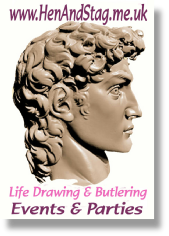 As the popularity of Life Drawing for Hen Parties grew, RAM took advantage of its unparalleled experience in the field of Life Drawing, combined with its unique access to the largest list of experienced Life Models / Tutors to provide QUALITY Life Drawing Events to Social Groups, (Hen / Stag) and Corporate Groups across the UK. We use a simple booking process and a very effective recruitment procedure for Model/Tutor & Butlers and so quickly gained the confidence of most of the Hen/Stag event companies whilst keeping an attractive realistic price structure for our high street clients. As time progressed, our client group widened to encompass Stag Events and Corporate Groups - as well as a growing reputation for serving the LGBTI community. We concentrate on ensuring the ease of booking, talent and suitability of our Models/Tutors and an over all reliability and quality that results in a superlative, inclusive service across the country. Our offering has expanded meeting the growing demand, we quickly tailored our service to encompass the LGBTI community and in 2010 presented our now extremely popular BUTLERING service / option. We aren’t limited to one area or region of the UK, rather actually delivering events across it all. Our talented & experienced Teams Members (Butlers, Model/Tutors) reliably covering the entire country. Swiftly and reliably manage enquiries. Provide OPTIONS that enhance your events. Our Social Media Links are New - Why not try them out for us?